I had this craftsman 5/8hp router that I inherited from my father-in-law a while ago. It was all plastic and really light. I used it to do some decorative inlay work, and for that it was ok. I did find that it’s light weight made it easy to make unintended movements when doing light touch work. I figured a heavier router would help. I decided on the 895PK because it comes with a height adjustment crank that goes through a table insert to engage the elevation adjuster on the fixed base. I bought from Amazon and it arrived two days later. Unfortunately it was the beginning of my work week and I’ve not had any time to open it up until today. 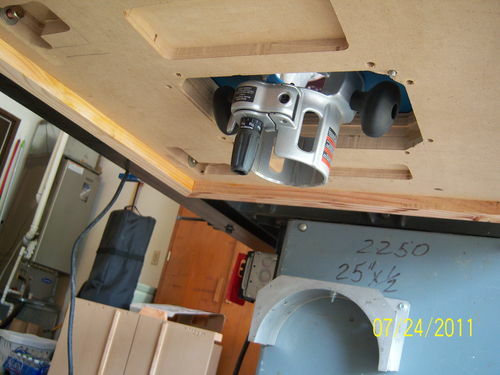 I had one final cut to make on my router table in progress, to cut a channel for a miter slot. I did all of the router work on this table so far with the old craftsman, and at times I though it was going to blow up in my face. The first time I started the new PC router it spools up so smooth and nice. It’s really quiet too. Not much for vibration, and the motor doesn’t bog down under load. It just seems to work perfectly as advertised. I decided to not use the spindle lock when I put in my 3/4” bit, and instead used two wrenches, and didn’t tighten it very much, it doesn’t take that much, or you’ll damage the collet. I’ve heard so much about the spindle lock becoming damaged when it’s used. I personally believe it’s mostly due to over tightening, but that’s just my opinion. The pin is steel, spring loaded, and pushes into a hole in the steel shaft. I don’t really see how this would break very easily. I’m from the old school of mechanics, so I prefer using two wrenches, it’s safer for the tool. The power switch is located pretty well, but it would be nice if it stuck out a bit more to be easier to just flip it on/off. It will just take some practice, no biggie. The only real gripe I have is about the case. The motor goes into the fixed base and lays on one side of the case, and the plunge base goes in the other side without the motor. The way the supports in the case are molded, you can’t put the motor in the plunge base and put it in the case, like if you have the fixed base installed on a table and you want to store the motor in the case. You can’t do it properly. I suppose I could force it to fit, but that’s not the point. Thee plunge base was a joy to use. I mounted the bit, pushed the plunge down until the bit touched the table and locked it there. Then I put the miter rail I was trying to mount on the turret and lowered the bar onto it and locked it there. Then I unlocked the plunge and pushed it down until the depth stop hits the turret. Perfect depth of cut. Way easier that using a screw ring to eyeball the depth. I’ve also heard a lot of gripes about the slop in the plunge action, side to side movement. While I don’t see much at all in mine, I will say that as far as I use a router, I think this is a non-issue. The only way this would be a problem is if you were using it to drill a hole straight down, and not move sideways at all. 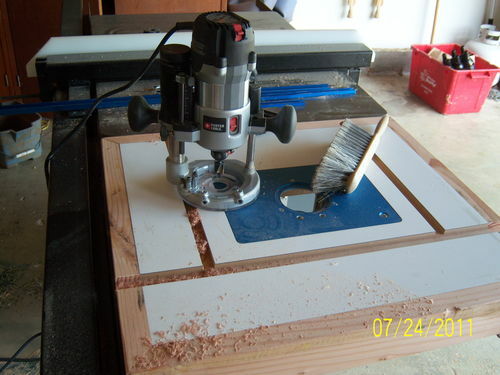 If you were doing that kind of a cut, there are better tools for it than a router. A drill press with a forstner bit comes to mind. I’ve only had this router for a day, so take what you want from this review. I may revise it later after I’ve used it for a while. My opinion is that it’s a great buy, with fantastic fit and finish, lots of power, versatility, and accuracy. Very nice. I have this router as well.. Since PC revamped the plunge base to be pretty much identical to the dewalt 6182 plunge base, it’s probably one of the best out there. I’ve never had any issues with my dewalt plunge base. It’s a dream to work with. I agree with your views on this router; I got mine for submitting a tip to ‘Wood’ magazine a couple of years back, and it’s a big improvement over the old router that I had. I also like the substantial table you have built for it. I have this router and think it is great router. The only issue I had was the bit sometimes walks out. I cleaned the colette and don’t seem to have the issue anymore. That’s interesting, I’ll keep that one in mind. 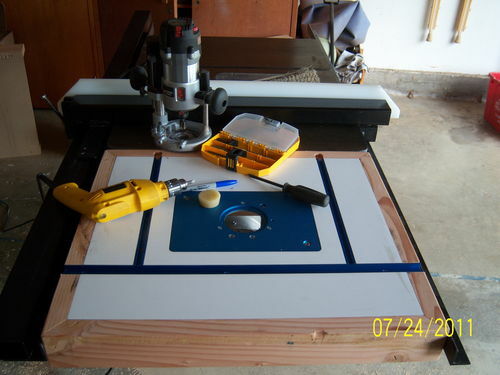 I picked up the PC 890 kit a couple of years ago and have a similar setup with the Rockler router plate. A couple of days ago I was using my router table for the last time for my project when the pin that holds the locking lever fell out. I can’t believe that the router base would fail with such little use. I don’t think that I have more than 200 hours using the router in my router table. Fortunately, I had my old PC 690 that I could swap in to finish the job. Porter Cable should put a disclaimer on their boxes “not intended for regular use”. This is the second PC product that has failed me. They have lost my customer loyalty. -- The wood is good. Congrats on your new router enjoy. Right now until Nov 22, 2012 my local Woodcraft store is selling the PC 895PK which includes the PC 450 trim router for $299. I’m picking up mine this upcoming week. I thought about the Bosch 1617EVSPK for relatively the same price but the 895PK includes the trim router. I take good care of my tools and just do hobby work so I’m not going to stress this package very hard, it should last me a long time. Very excited to get it! Upgrading from a Craftsman 1 1/2hp, 1/4 inch only router. My Craftsman still works but I’m limited with the 1/4 collet.